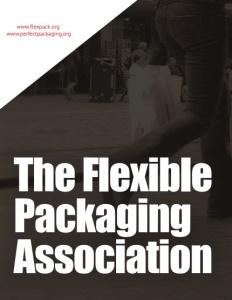 The Flexible Packaging Association (FPA) is the U.S. trade association for manufacturers and suppliers of flexible packaging. Established in 1950, the FPA has seen the industry grow from $400 million in the early 1950s to $31 billion today. Flexible packaging is at the forefront of important packaging trends in product protection, design and performance, consumer convenience, and sustainability, all of which positively impact the environment, consumers, and businesses. Flexible packaging is any package, or part of a package, whose shape can be readily changed. It includes packaging made with paper, plastic film, foil, metalized or coated paper and film, or a combination of any of these materials. Flexible packaging includes bags, pouches, labels, liners, wraps, rollstock, and flexible lidding. This packaging includes everyday food and beverage products such as candy, salty snacks, yogurt, and beverages; as well as health and beauty items and pharmaceuticals, such as aspirin, shampoo, and shaving cream. Flexible packaging is also used for medical device packaging, such as absorbable sutures and artificial joints. Flexible packaging has facilitated many of the products in our grocery stores today — products that simply did not exist a few years ago. Today’s shoppers buy bagged salad greens that stay crisp for days; frozen vegetables that steam right in their packages; pouches with snacks that stay fresh with zipper closures; antibacterial wipes; and easy-to-use and transportable laundry detergent, among others. Consumers are conscious of the products they purchase and the packaging that holds and protects those products. They are seeking the convenience; extended shelf life; and sustainability features that flexible packaging provides. 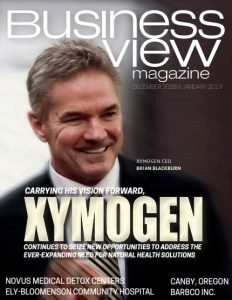 Flexible packaging manufacturers are responding to these key issues and innovating in order to ensure the safety and protection of the product; prevention of contamination and food waste; freshness and prolonged shelf-life; ease of transport, storage, and use; and source reduction and end-of-life management. Not all flexible packaging is the same. Different products require different types of protection. Some flexible packaging is made from a single material, however, in many cases, multiple materials are required to provide the appropriate barrier and product protection. In multi-material packaging, each layer performs a different function in protecting and preserving the product. By using materials with properties geared toward specific performance, manufacturers can meet their customers’ varying needs, including as stated above, contamination prevention and extended freshness, but also puncture, tear, and burst resistance as well as tensile and seal strength. For example, high barrier films scavenge food odors and prevent leaks; and medication and medical devices can be easily and safely dispensed through sterilized, tear-open packaging engineered for dosing compliance. By protecting the products, flexible packaging reduces returned merchandise along with all associated operational and environmental costs. 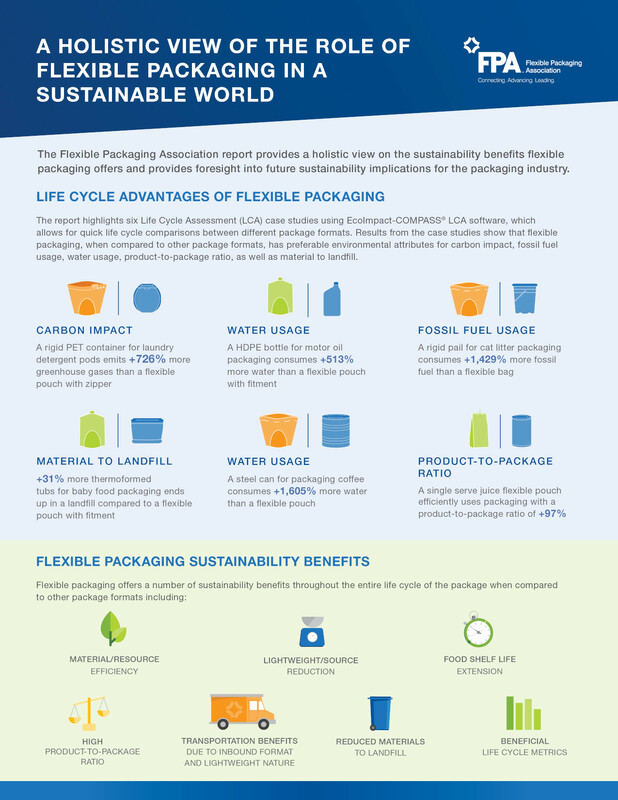 Flexible Packaging Association advocates on the environmental benefits of flexible packaging. When assessing sustainability, examining the full life-cycle of a package is critical. Flexible packaging is the optimum environmental choice because it uses fewer resources, generates fewer emissions, and creates less waste in the first place. Flexible packaging starts with using fewer resources and has the ability to package the most product in the least amount of packaging possible, positively impacting municipal solid waste, energy use in manufacturing and transportation, and greenhouse gas emissions. Producing a flexible foodservice pouch requires 75 percent less energy and generates just 1/10 of greenhouse gas emissions during production than a metal can for the equivalent amount of product. Just 1.5 pounds of flexible packaging will package the same amount of beverage or liquid foods as 50 pounds of glass. The U.S. recycling rate of a steel can would need to increase from 71 to 93 percent and the plastic lid would need to increase from 21 to 75 percent for a steel coffee can to have the same amount of landfilled material as a flexible stand-up coffee pouch. A recent study by the Natural Resources Defense Council shows that up to 40% of food in the U.S. goes to waste. Food waste is the number 1 contributor to greenhouse gas emissions. Flexible packaging helps to reduce this waste. The shelf life of cucumbers is extended from 3 days to 14 days when wrapped in a polyethylene shrink wrap. The shelf life of beef is extended from 4 days to up to 23 days when vacuum packaged in an oxygen barrier film. Food waste is reduced from 11 to 0.8 percent when bread is packaged in a biaxially oriented polypropylene film. Packaging grapes in perforated bags lead to a 20 percent reduction of in-store waste. And, bananas last 36 days in perforated polyethylene bags versus 15 days unpackaged. 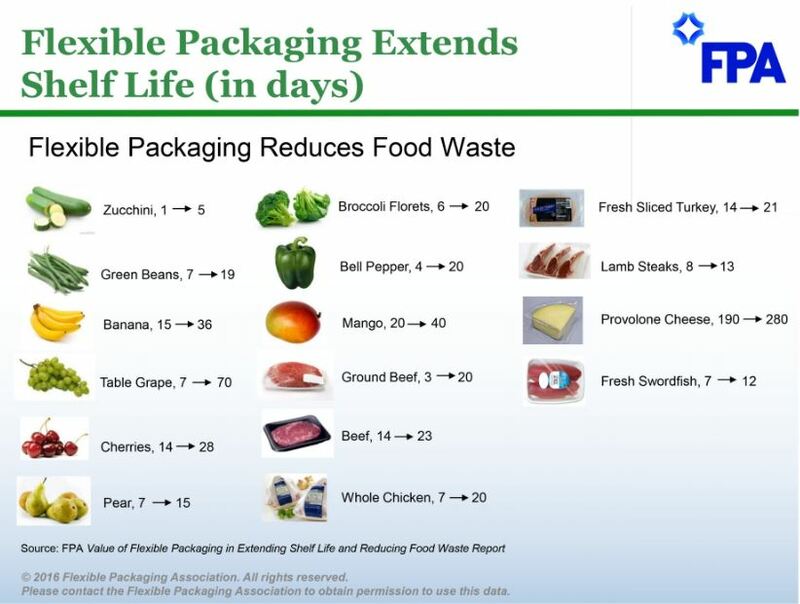 These are just some of the many examples of how flexible packaging is extending shelf-life and prolonging freshness to inhibit food waste. Flexible Packaging Association also advocates on end-of-life options for flexible packaging. There is no single solution that can be applied to all communities when it comes to the best way to collect, sort, and process flexible packaging waste. FPA is working with a number of programs to address this. Firstly, single material flexible packaging (polyethylene), such as grocery bags, air pillows, bubble wrap, overwraps for toilet and tissue paper, and dry-cleaning bags, can all be currently recycled through in-store drop-off programs. Secondly, FPA and its members are working with recyclers, retailers, waste management companies, and brand owners on the Materials Recovery for the Future (MRFF) project, which is piloting a program to show how the current municipal solid waste recycling infrastructure can be changed in order to accept and recover the multi-material packages, which are not yet readily recyclable. Thirdly, FPA is sponsoring the Dow EnergyBag program, which collects the multi-material flexible packages curbside for energy recovery. Flexible Packaging Association also produces industry research, including the annual State of the Flexible Packaging Industry Report, and holds two member meetings a year. In 2017, FPA estimates an annual U.S. industry revenue of $31 billion and a volume of 18 billion pounds of material. The flexible packaging industry employs close to 79,000 people in the U.S. The average U.S. flexible packaging converter is a small to medium-sized company with annual sales totaling approximately $75-76 million. The top 100 U.S. flexible packaging companies (out of the estimated 411 companies) account for 79 percent of the total U.S. industry revenue with an average size of around $240 million. The top 10 U.S. flexible packaging companies account for just over half (54 percent) of the U.S. flexible packaging industry revenue and have average sales of about $1.6-1.7 billion. The majority of U.S. flexible packaging plants are concentrated in the Midwest, although many plants exist in the Southeast and in California.